Complete and balanced food for normally active adult dogs. 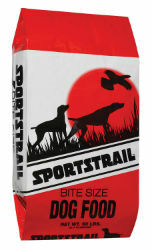 Made from selected high quality ingredients and fortified with essential vitamins and minerals, Sportstrail® Bite Size promotes strong muscles and bones and glossy skin and coat. It supplies your dog with an outstanding diet for a healthy and active life and is naturally preserved. Dogs love the meaty taste! Serve Sportstrail® dry or with a small amount of warm water. It is recommend to divide the daily amounts between two meals. Ground Corn, Corn Gluten Feed, Wheat Middlings, Meat Meal, Soybean Meal, Chicken Fat (preserved with mixed Tocopherols), Calcium Carbonate, Salt, Potassium Chloride, Choline Chloride, Vitamin A Supplement, Vitamin D3 Supplement, Vitamin E Supplement, Zinc Sulfate, Ferrous Sulfate, Niacin, Calcium Pantothenate, Riboflavin Supplement, Copper Sulfate, Pyridoxine Hydrochloride, Thiamine Mononitrate, Manganese Sulfate, Zinc Proteinate, Manganese Proteinate, Copper Sulfate, Pyridoxine Hydrochloride, Thiamine Mononitrate, Manganese Sulfate, Zinc Proteinate, Manganese Proteinate, Copper Proteinate, Calcium Iodate, Cobalt Carbonate, Folic Acid, Sodium Selenite, Biotin, Vitamin B12 Supplement.